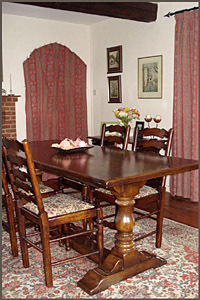 SPECIAL OFFER FOR HOLIDAYS FOR TWO BOOKED IN MAY - Stay three nights and have a free evening meal. 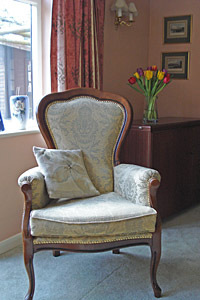 A warm welcome is waiting for you in the comfortable en-suite accommodation in our home, which dates from the 19th century and is in the historic village of Wellesbourne. 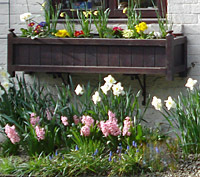 Come and stay with us, enjoy the charm of the area and relax while we look after you. A first–class BREAKFAST, made up of local and organic produce where possible. ENGLISH BACON and award winning sausages from the village butcher, FREE RANGE EGGS from a local farm together with locally grown mushrooms. 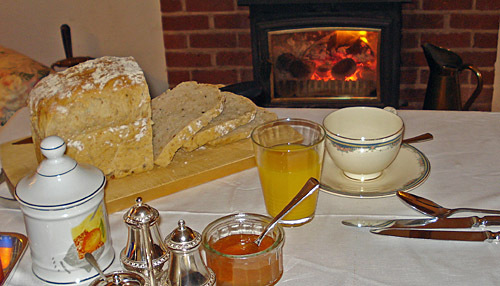 All the BREAD is HOME-BAKED and the marmalade is also home-made. We also provide EVENING MEAL if you would like one. This does need to be pre-booked before you come to us. We use home-grown vegetables and fruit in season, when available, from our garden. 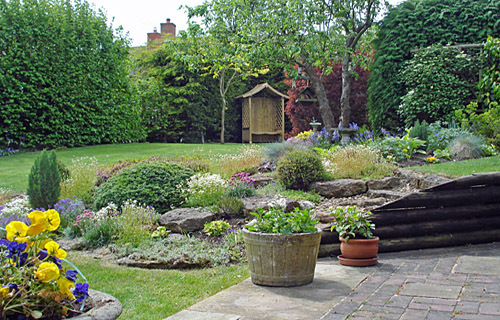 You will see from the photographs on this web-site that there are many attractive areas around Wellesbourne. 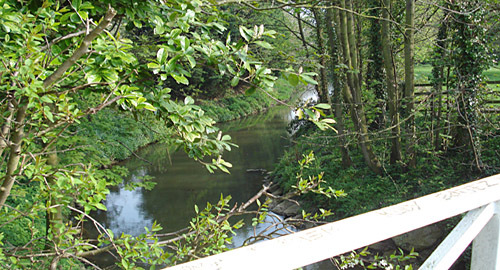 We have many country walks within just a few minutes from the house. 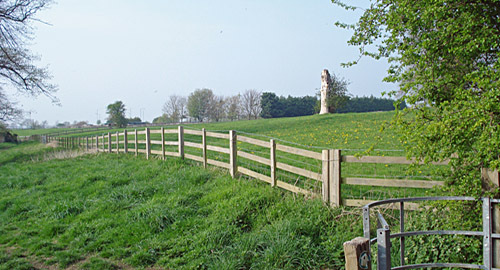 So, if you like walking, bring your boots and step out from the house to explore the local countryside. We have some maps we will be happy to lend you, too. You may wonder why the house is called the Old Dispensary. Well, the story goes that in the early 1800’s, there were two doctors living in the village. One of them, who lived in the Red House in Chestnut Square, which is still there today, had all the wealthy patients in the area. The other, who also lived in Chestnut Square, had very few paying patients. Those who couldn’t pay him, he didn’t visit, but summoned them to his “dispensary” as he called it, which was then just a barn, but is in fact the front of our house. The story continues that his favourite cure was to give them a token and send them round to the Stag’s Head pub to exchange for a pint of ale. The pub is still there and still serving excellent beer, but I am afraid we don’t provide any tokens! 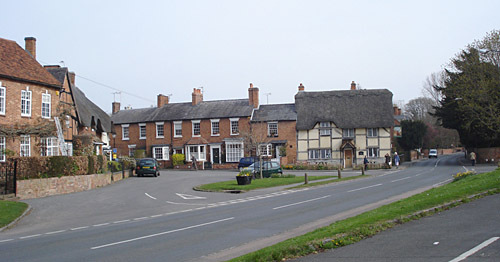 WELLESBOURNE makes a very good base for exploring the area. 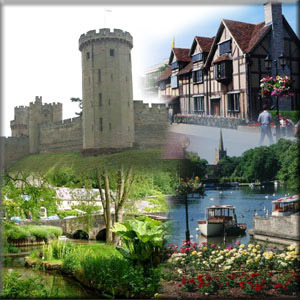 STRATFORD-UPON-AVON is only 5 miles away with all its many attractions. NATIONAL TRUST houses and gardens are all around us and the COTSWOLDS are only about a 30 minute drive away. Wellesbourne is in close proximity to Stratford-upon-Avon, Leamington Spa and Warwick with its fantastic castle (see below). It is also a good base for the Heritage Motor Centre at Gaydon, the Warwickshire Agricultural College at Moreton Morrell and Compton Verney Art Gallery. There is off-road parking for all our guests. We are not licensed, so please bring a bottle of wine with you. St Mary's Church with the famous 14th Century Beauchamp Chapel, the Lord Leycester Hospital, the towns two remaining defences of East Gate and West Gate, three museums and the riverside parks and gardens are just some of the delights of the County town. Birthplace of William Shakespeare and another of Warwickshire's lovely riverside towns. Visit one of the Stratford theatres, The Royal Shakespeare Theatre or The Swan. Follow the Shakespeare Heritage Trail and enjoy the wealth of half timbered buildings in this ancient town. 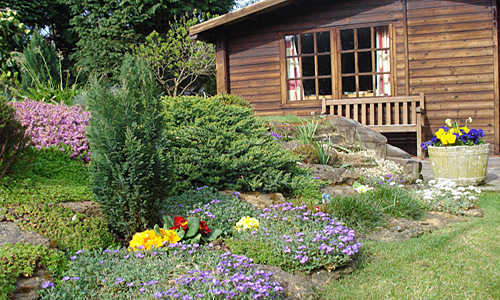 Take a boat trip on the River Avon or simply enjoy the beautiful gardens which help to make Stratford a regular winner of the "Britain in Bloom" competition. Leamington grew from a handful of houses and an hotel in 1800 to one of the most fashionable resorts in the country in 1850. Now a prosperous town on the River Leam, famous for the Jephson Gardens and the restored Royal Pump Rooms. 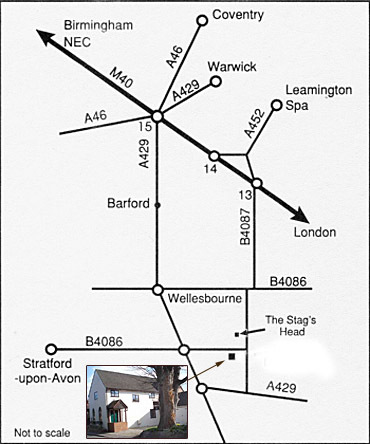 Leamington is a beautiful Regency town with an excellent range of shops both large and small. Kenilworth Castle, one of the grandest and most romantic ruined castles in the country. Once home to the favourite of Queen Elizabeth I, Robert Dudley Earl of Leicester, and now maintained by English Heritage. Warwickshire also has many fine historic houses and gardens owned by the National Trust, all within an easy drive from Wellesbourne. The National Exhibition Centre is approximately 30 minutes drive, the National Agricultural Centre at Stoneleigh Park 15 minutes. For those of our guests who do not have transport, we will gladly arrange for a taxi to meet you from any of the airports or railway stations. Shakespeare's Stratford on the Web / QuinSolve &COPY; /May 2011.